Acne scars are not only surface deep. They can affect your confidence and self-esteem years after your acne is gone. Whether you’re dealing with adult acne or have scars left from your hormonal teenage years, acne scars can be diminished with Dermapen microneedling. This effective treatment for acne scars consists of a revolutionary device designed to rejuvenate skin. 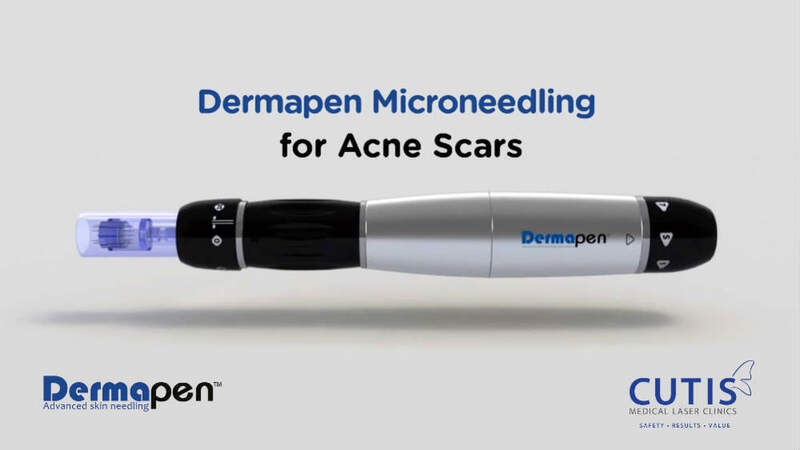 If you want to know how to remove acne scars left from severe acne breakouts, consult with our skin doctor in Singapore about Dermapen microneedling. How Does the Dermapen Work? Microneedling involves the use of a mechanized device known as the Dermapen. 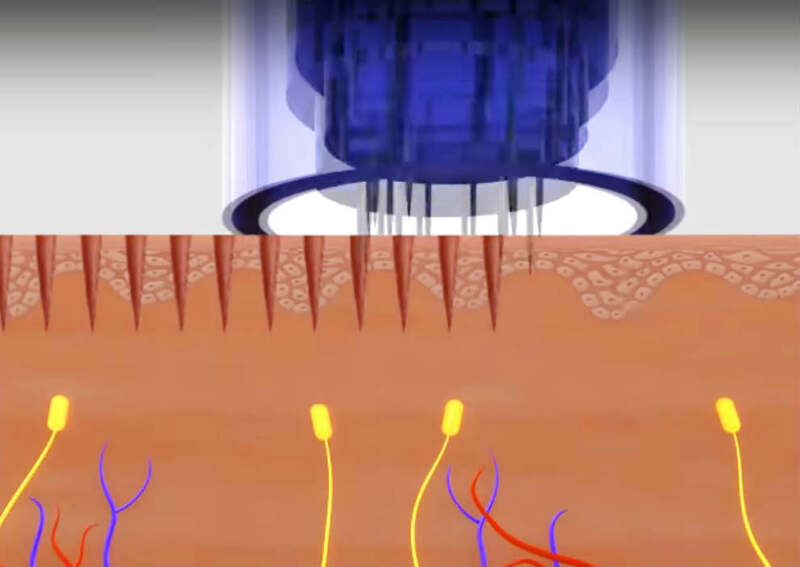 The Dermapen treatment creates thousands of miniscule needle punctures in the outer layers of skin. These tiny needle pricks are precisely controlled by the Dermapen device to achieve a specifically set depth, spacing, pattern, and frequency. The physical nature of “skin-needling” breaks up fibrous and uneven scar tissue and stimulates the growth of new tissue. Additionally, Dermapen helps to improve blood supply on the treated area which creates healthier skin, as well as provide a healthy foundation for new skin. In addition to diminishing both pitted and non-pitted acne scars, microneedling has been proven to show improvement in freckles, fine lines, sun spots and stretch marks. The procedure can have minimal discomfort but the application of number cream can make the treatment more comfortable. Many patients describe the feeling of microneedling as a deep facial with vibration. After the procedure, you may experience mild side effects such as redness and tingling sensation. Dermapen microneedling requires five to seven days downtime and most patients are able to return to work the next day. Results can be seen for a period of four to six weeks. For the best results, at least five sessions are needed. How Does the Dermapen Differ? You may be wondering how microneedling differs from other non-invasive procedures like laser treatments. It’s true that lasers have the ability to treat various skin conditions like uneven skin tones, stretch marks, and scars. However, not everyone is a good candidate for laser treatments, including those with darker skin tones. Dermapen microneedling can be used on all skin types and can help eliminate a wide range of skin problems such as age spots, brown spots, wrinkles, hyperpigmentation, stretch marks, and deep acne scars. Dermapen is a safer and more effective method than traditional micro needling rollers. Advancements in technology has made it possible to safely stimulate the skin’s surface to enhance collagen production and achieve elastin rejuvenation. 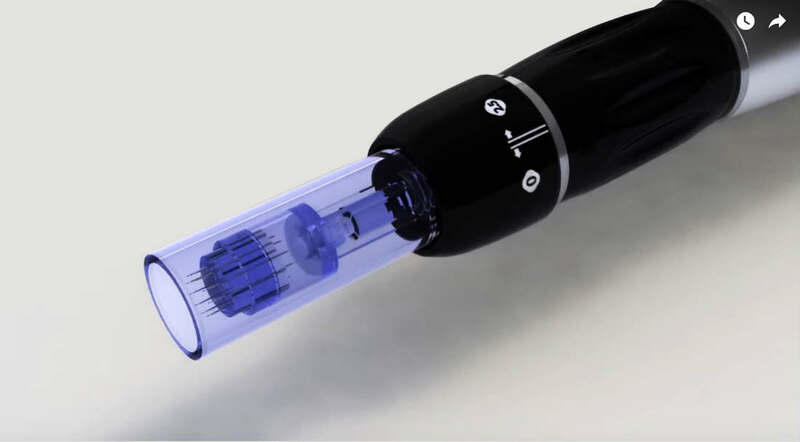 Dermapen features adjustable and multi-speed settings that allow the device to be personalized to each patient. The needles pierce the skin at 90 degree angles to increase the effectiveness of the procedure which results in the increased absorption of skin care products while minimizing downtime. To determine if you’re a good candidate for acne scar treatment, consult with our Harvard-trained skin specialist in Singapore, Dr. Sylvia Ramirez at the Cutis Laser Clinics. Just one treatment at our aesthetic clinic stands in the way of you and clearer, more beautiful skin.